We’ve added a question to Clicklaw that gets asked quite often by people who visit our Courthouse Libraries – How can I get my Certificate of Divorce? Does it make my divorce official? What forms do I need? Our new Common Question clarifies that you do not need a certificate to make your divorce legal, but that it can be useful in some cases. gives 3 options for how you can apply for it: (1) at a Supreme Court Registry in person – if you have a lawyer, or (2) in person if you are doing it by yourself, and (3) via snail mail. We also include tips on finding your court file number, and getting a copy of your divorce order. Clicklaw Wikibooks is Clicklaw’s companion site – it provides plain language legal information and is a platform for lawyers and legal organizations in BC to publish and update legal information in a range of different digital and physical formats by editing a single source. I like to call it a curated wiki of BC law. In addition to reading the Wikibooks online, you can find several of them in print at your local public library, through the LawMatters program. JP Boyd is a well-known family law expert and the founding author of this post’s featured Clicklaw Wikibook, which is updated by BC lawyers. Both the Galaxy S4 and Nexus 5 run on Android. The iPhone runs on iOS. 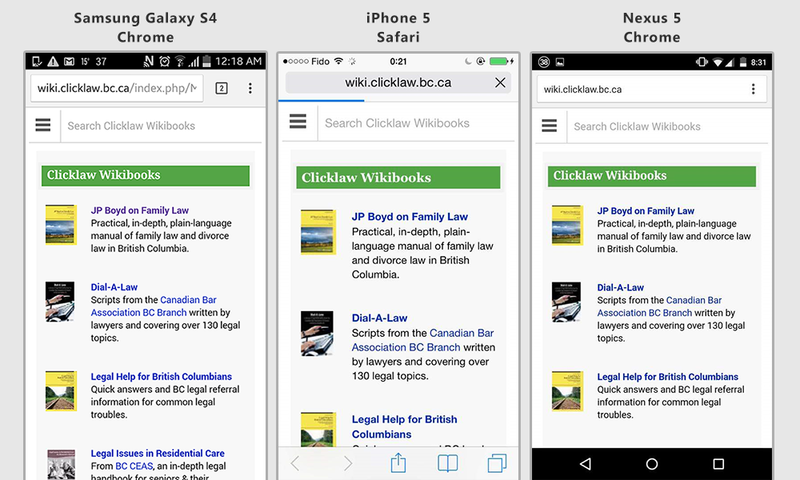 But you get a similar experience looking at wiki.clicklaw.bc.ca across all devices. Do you have a smartphone? You can already read the Clicklaw blog in a mobile-friendly format, and our Clicklaw Wikibooks (which have helpful legal info on family law, residential tenancy law, wills and estates, and more) now have a mobile option too. We are working on making the main Clicklaw website mobile-friendly, stay tuned. Why go mobile? Mobile use is not going away; in fact, it’s increasing every year. 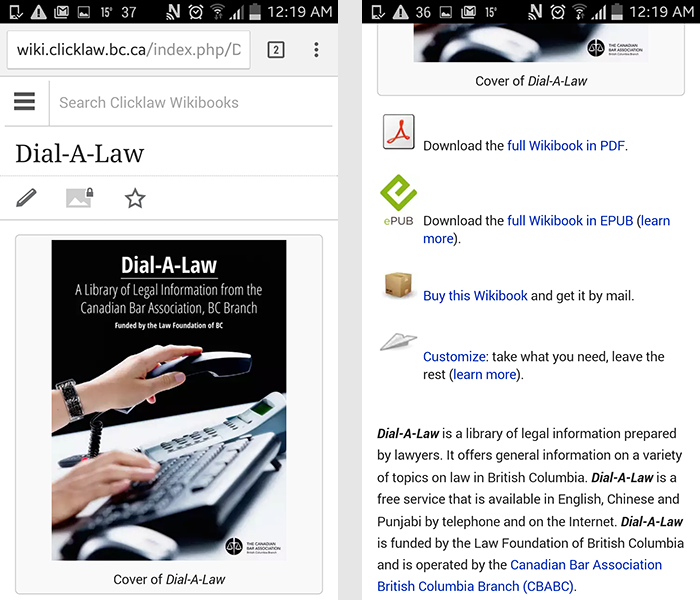 Nearly 33% of visitors to Clicklaw and the Clicklaw Wikibooks are on either mobile or tablet. We wanted to make the experience better for you, across all devices. You still have the option of downloading the Wikibook in PDF, EPUB, or ordering a print copy–right from your phone. See more features below the cut..